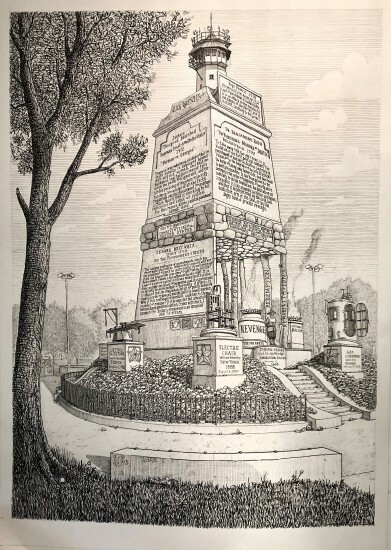 As part of the ongoing “Imaginary Monuments” series (2007 - present), Sandow Birk has created a fourth gravure in the project: "Proposal for a Monument to the Declaration of Independence (and a Pavilion to Frederick Douglass)." 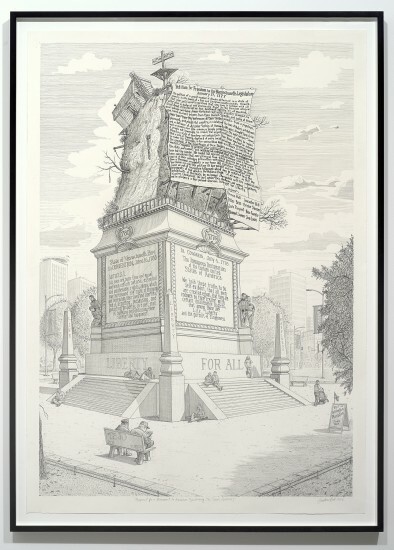 This new image proposes a monument to the text of the Declaration of Independence replete with all the ironies about whose freedom it protects therein (the Pavilion to Frederick Douglass). 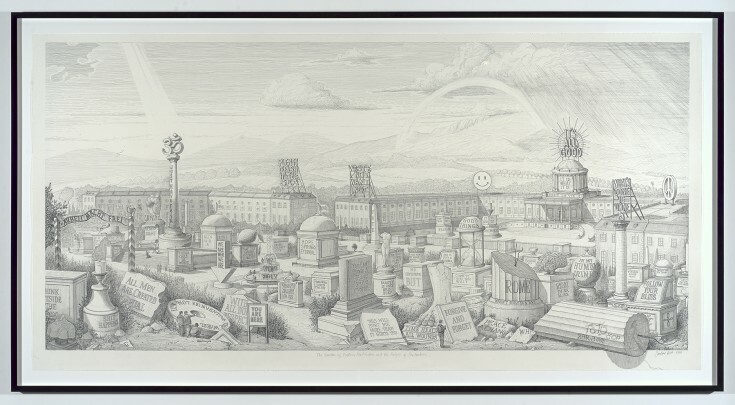 The composition of the main structure that houses the Declaration’s text is rendered in a neoclassical style reminiscent of the Capitol and other government buildings from the period in Philadelphia and Washington, D.C. 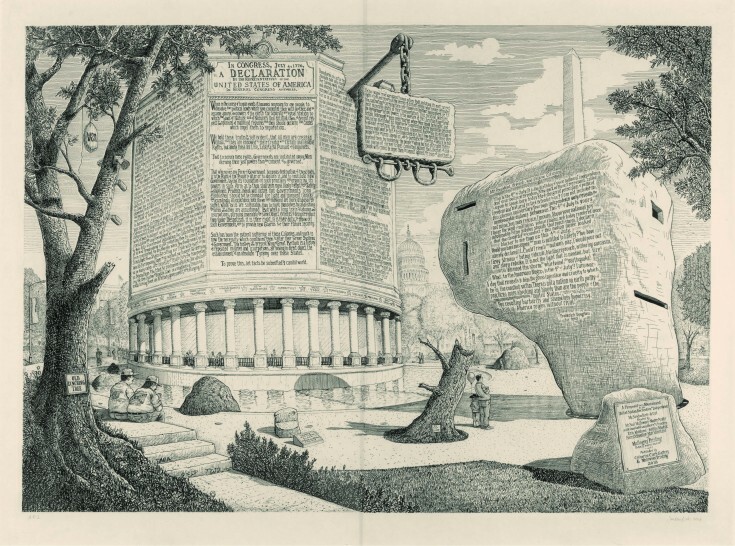 Suspended from the upper portion of the cracked and worn neoclassical architecture is a heavy bar and chain holding a sign inscribed with a passage written by Thomas Jefferson decrying slavery. 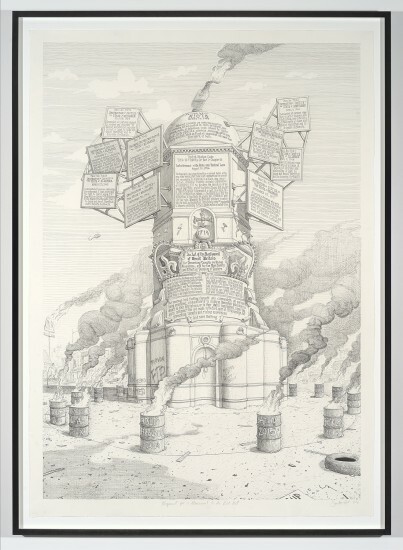 This text was omitted from the final draft of the Declaration of Independence. 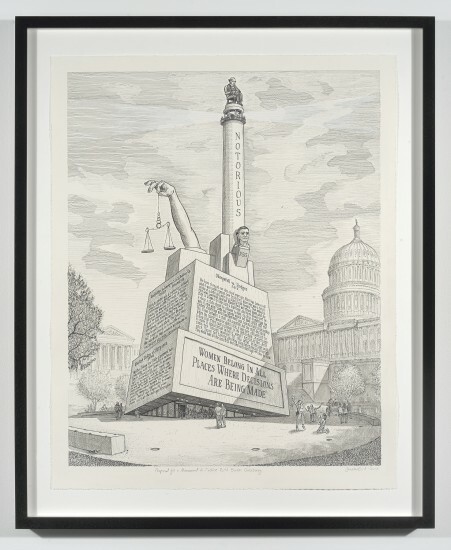 And in fact here, it remains outside of the main monument, engraved on a plaque that inauspiciously hangs overhead, casting a shadow of shackles and chains—accoutrements of the slave trade—onto the Declaration’s text. 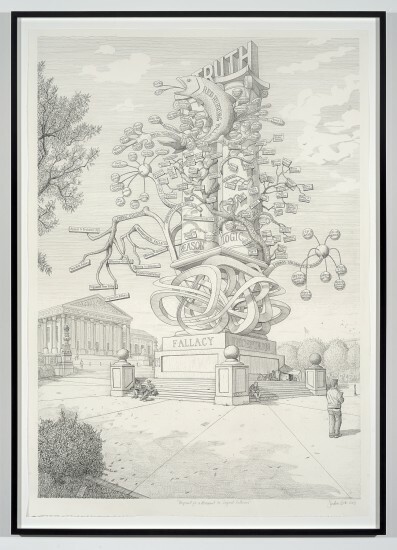 Birk’s gravure further reminds us of the era’s paradoxical approach to issues of freedom and slavery in a second structure—the so-called pavilion—rendered across from the neoclassical monument. 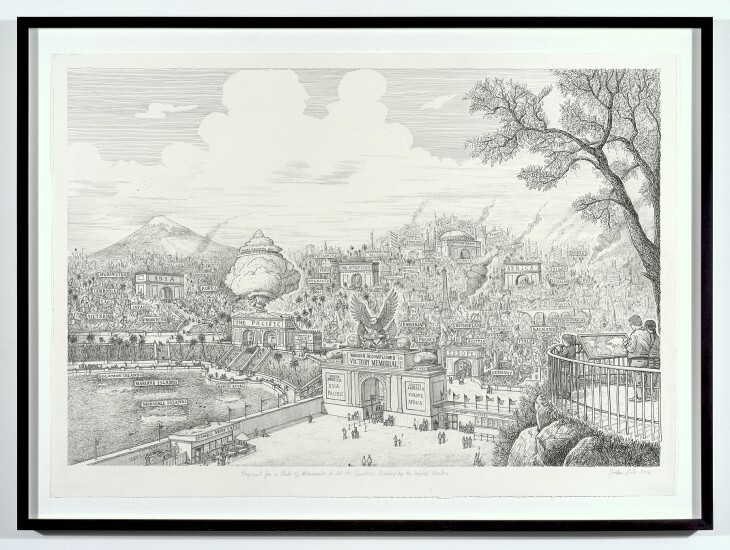 Enshrined on this rock-like memorial or pavilion are texts excerpted from the abolitionist, Frederick Douglass’, July 5, 1852 speech, What the Fourth of July Means to the Slave, which critiques how freedom is unequally distributed to people of color. 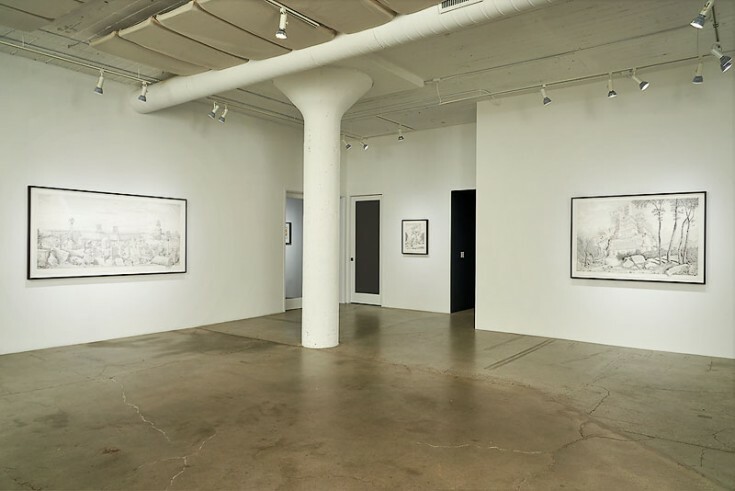 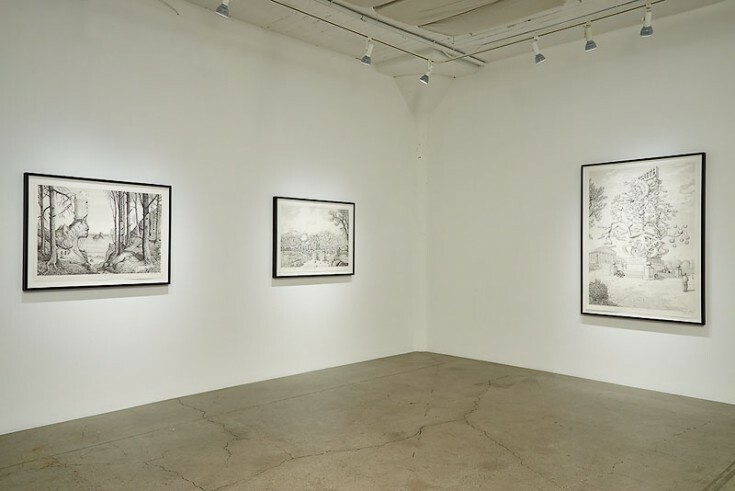 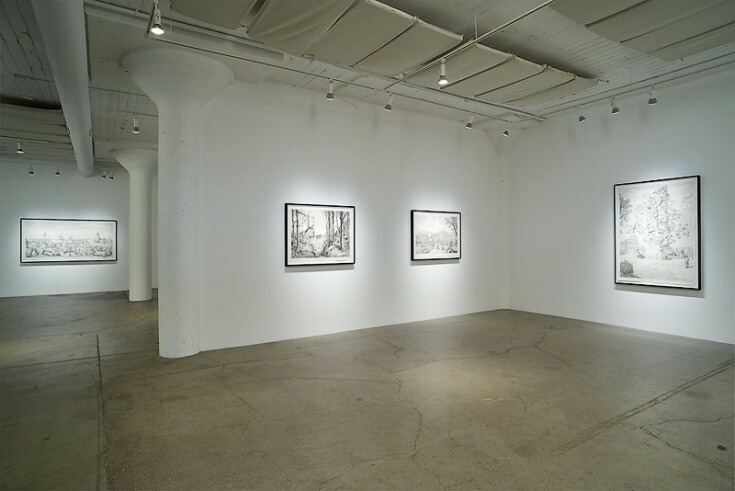 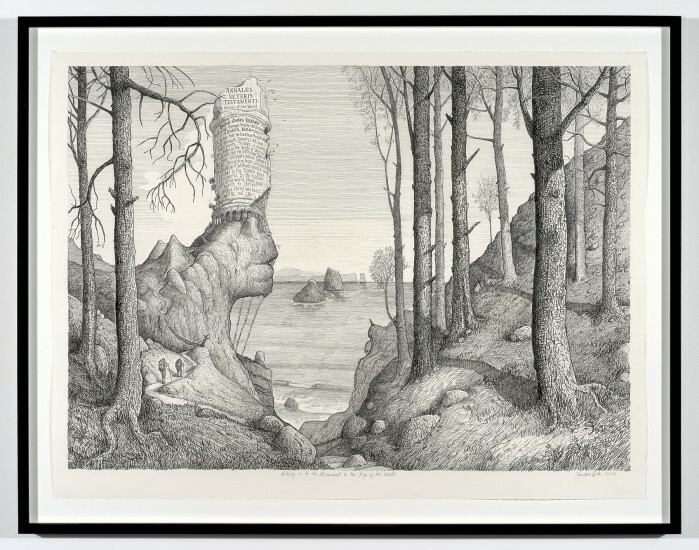 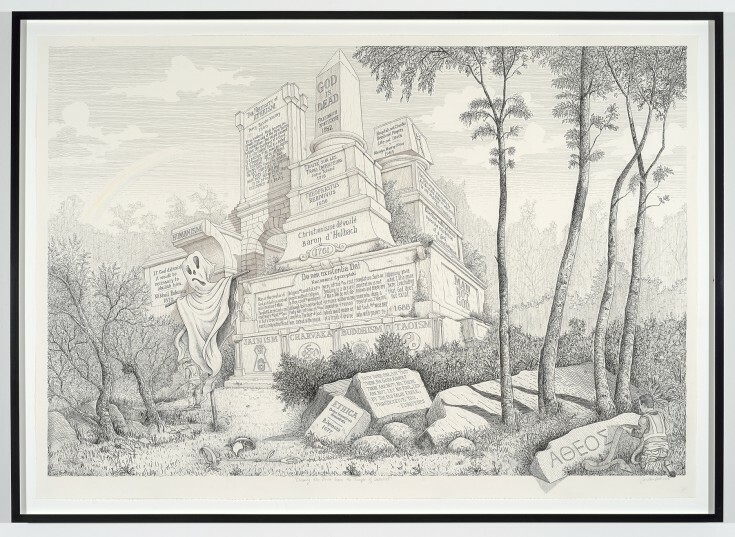 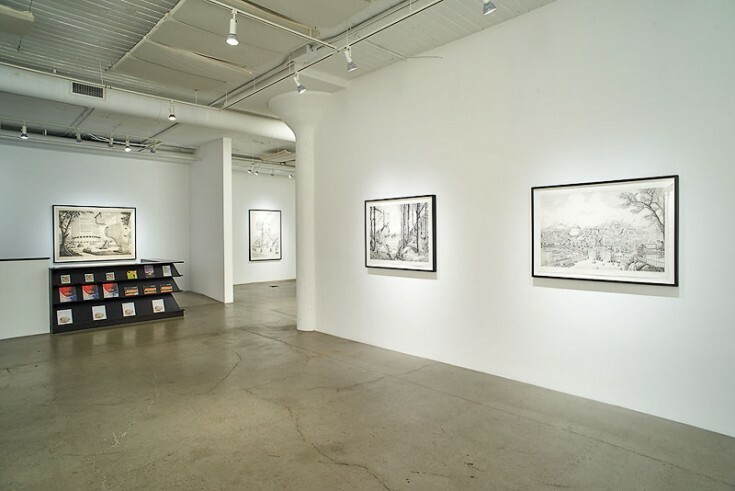 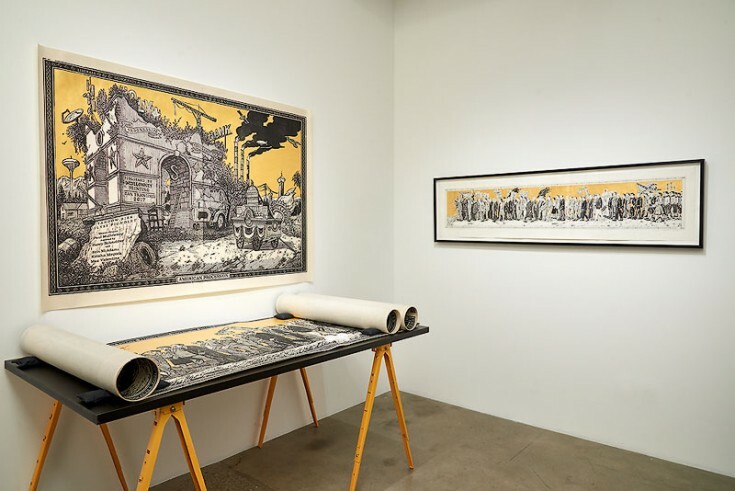 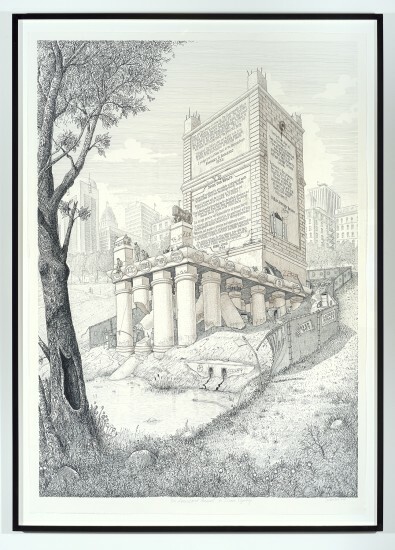 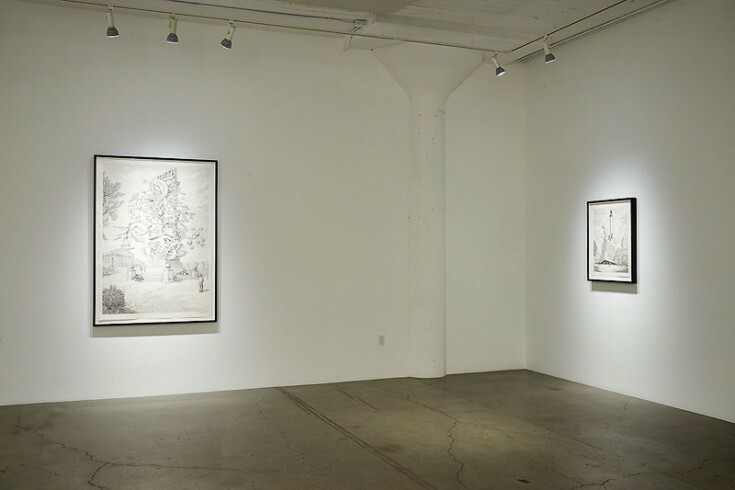 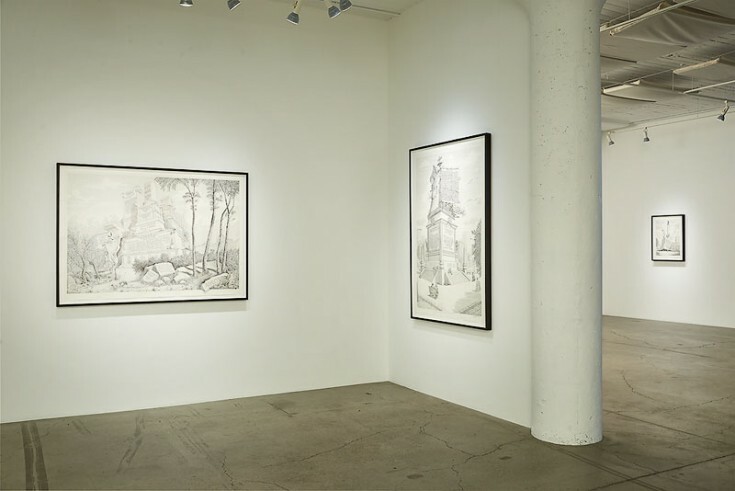 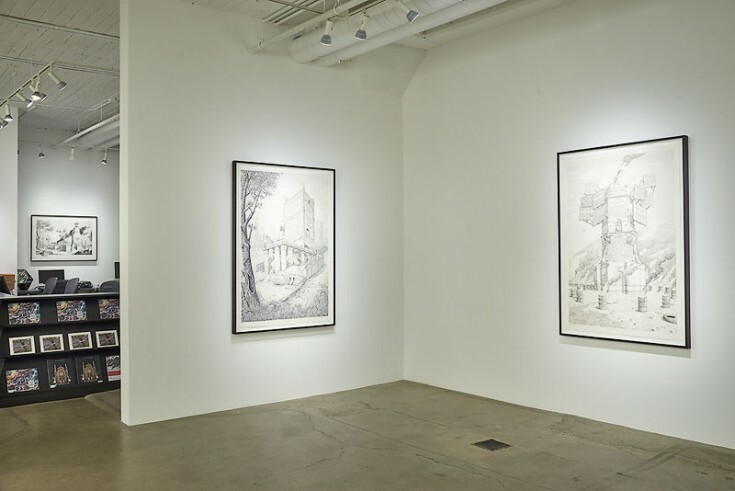 Sandow Birk’s solo exhibition debuts a new series of large scale drawings from the artist’s "Imaginary Monuments" project (2007 – ongoing), in which the artist uses historic texts as central elements for renderings of fantastic and often precarious imagined architecture.